Fossil fuels play a major role in meeting the energy demand of the nation and are expected to continue doing so in the foreseeable future. Oil & gas resources form a major part of our primary energy mix and touch our lives in more ways than one. The developing Indian economy has been constantly challenged for sourcing primary energy. India is dependent on imported crude oil to the extent that recently the US Energy Information Administration (EIA) has observed that India was the world’s fifth largest net importer of oil in 2012, importing more than 2.2 million bbl. /d , or about 70 percent of consumption. Natural gas pricing in India is diverse and complex in nature. India is one of the few countries where different types of basic prices of gas are prevalent. Across the gas value chain and particularly for consumers, the complexity in the pricing of natural gas in India has resulted in enormous problems. Background for gas pricing in India: Committee observed that as there is no gas on-gas competition in India, which is unlikely to happen for several years, it proposed a formula based on wider global prices. Further, even as the global gas markets are not coherent like oil markets, committee proposed a formula based on average of net-backs for producers and average of exchange traded prices. b) volume-weighted price of US’s Henry Hub, UK’s NBP and Japan’s JCC linked price. Committee has not commented on domestic gas allocation to sectors. The suggested formula will apply to pricing decisions made in future, and can be reviewed after five years when the possibility of pricing based on direct gas-on-gas competition may be assessed. •Since the PSC-related key financial recommendations are on prospective basis, they would not impact current PSCs and hence would not impact the profitability/NAV of current producing blocks of RIL/Cairn India. •However, the proposed gas pricing formula will have a meaningful impact on the domestic gas producers (RIL, ONGC, Oil India) as RIL’s KG-D6 gas price revision is due in March 2014 and would also influence prices for other gas producers like ONGC. • Committee’s recommendation to determine gas price through arms-length is a very positive one. However, views/affordability of the key consuming sectors like power and fertilizer would also weigh heavily on the final gas price decision in March 2014. The higher input price for fertilizer will have implications. 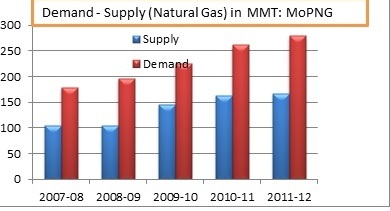 •Domestically produced gas price in the country would then be around $7-8/mmBtu at the current rate. However, any increase in domestic prices would negatively impact the downstream consuming sectors, predominantly power and fertilizer sectors. While power generation cost would increase compelling an increase in power tariffs, increase in feedstock cost for fertilizer sector would lead to increase in governments’ outlay on fertilizer subsidy. Currently power and fertilizer sectors consume about 2/3rd of domestic gas. For other industries which consume domestic gas as fuel the alternative fuel choice is liquid fuels. As a result any increase in domestic gas price is not likely to affect its competitiveness vis – a vis other liquid fuels. -ise in inflation sharply which is around 10.16 % already in double digit. -rise in prices in almost all sectors major sectors affected will be Transport, Auto, FMCG, Textiles. -The rise in LPG gas will cut the common man’s pocket deeply. -Impact on banking sectors as the hike may lead to raise in inflation which will urge RBI to raise interest rates thus affecting banks due to tightening of CRR. -The decision will help to rein in the fiscal deficit, which is projected at 5.5 percent of the gross domestic product in 2010/11 and free up revenues for other programs. -State oil firms currently lose about Rs 215 crores per day on selling fuel below the imported cost. Thus it will help these companies to make profits. Thus this can be summarized with a view point that there are some of the key issues that need to be taken care before implementing the recommendations by the Rangrajan committee because ultimately it is the end user or consumer who will be facing the brunt of the increase in net price in natural gas and LPG. There is an urgent need for Indian policymakers to draw on market oriented solutions to resolve the immense uncertainty that exists in the gas sector. This entry was posted in Uncategorized and tagged Coal, Hike in Oil Prices, MoPNG, Oil, Oil Pricing, ONGC, Petroleum, Pricing, Rangrajan Committee, Rangrajana.